Crushed pineapple and toasted marshmallows put the “sweet” in this family-favorite Sweet Potato Casserole. Some things are better left untouched. I’m all for innovation and trying new things and being open to different foods and traditions most of the time. 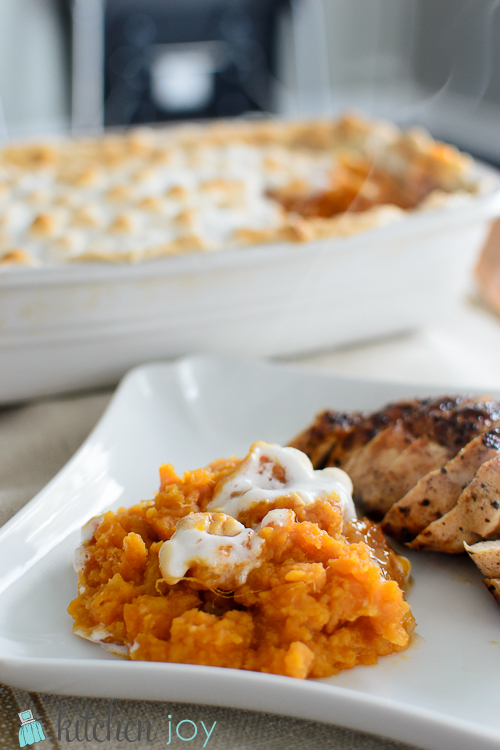 The ultimate exception to that rule is Sweet Potato Casserole on Thanksgiving. It’s a crime punishable to the highest extent of the law in our family if there isn’t a giant dish covered in toasted marshmallows at the table. I don’t want to know what would happen if we somehow forgot to make them one year. I can guarantee it would not be one of those offenses that everyone decides to forgive and forget. We would never hear the end of it. You just can’t mess with them. It’s wrong. It’s in my blood or something. On paper they sound kind of terrible considering I strongly dislike marshmallows on the other 364 days of the year. There’s just something about Thanksgiving that makes those little processed sugar filled pillows the perfect crunchy/creamy topping to the canned “yams”. I also choose to overlook my snobbish disdain for canned foods when it comes to this dish. You just can’t beat the version that has graced our table for decades. By the way, even though the label on the can says “Yams”, it is my understanding that that is incorrect. Yams and Sweet Potatoes are not one in the same, and the what is labelled as “yams” is actually sweet potatoes. I could be wrong, but that is what I’ve read. Call them whatever you want, but I call them sweet potatoes. I also call them amazing. This recipe is almost a non-recipe. It can easily be done freestyle and adjusted based on which cooking implement is most convenient during your Thanksgiving cooking process. 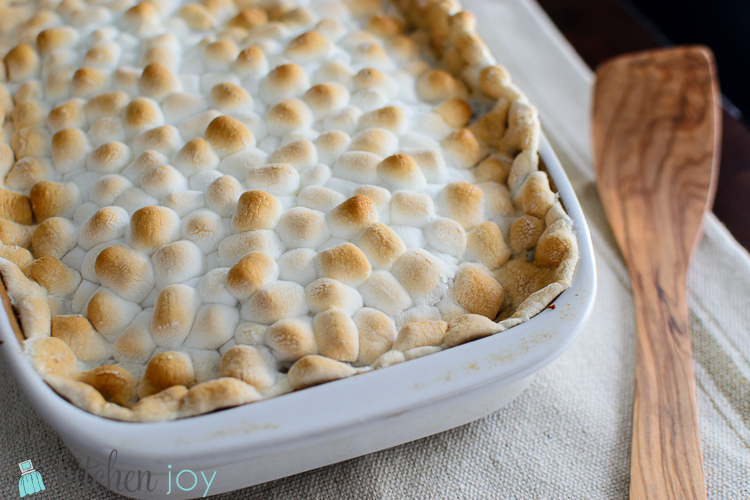 If you are running low on oven space, you can heat all of the ingredients in a pan on the stove and then just add to the baking dish and top with marshmallows. Just pop it in the oven at the last minute to toast the marshmallows on top. If you happen to have extra oven space, you can just mash all of the ingredients (minus the marshmallows) and add them to the baking dish and put it straight into the oven to heat through before topping with marshmallows and returning to oven to toast before serving. In a large bowl, mash together the sweet potatoes, crushed pineapple, brown sugar, melted butter, salt, and ground cinnamon. Spread mixture into a 9x13 baking dish. Bake 30 minutes, or until heated through, stirring a few times. Top with mini marshmallows and return to oven until marshmallows are golden brown, about 10 minutes, rotating halfway through. **Alternate stovetop method: Heat the sweet potato mixture in a large saucepan on the stove until heated through. Spread in a large baking dish and top with marshmallows and place in preheated oven until marshmallows are golden brown, about 10 minutes.